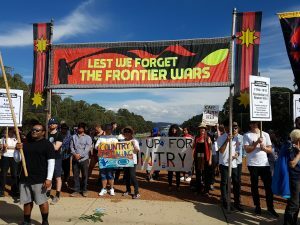 Janet Hunt and other ANTaR ACT members joined the annual Frontier Wars March on ANZAC day this year. This march, organised by Michael Anderson from Sovereign Union, follows the official march up ANZAC Parade but is always stopped at the roundabout, and not allowed onto the War Memorial forecourt where the official ANZAC Day event is going on. 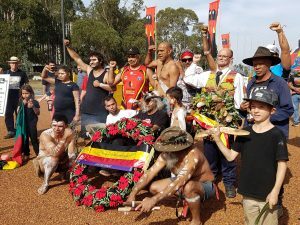 The march is a peaceful, respectful and solemn memorialising of all those who died in conflict between Aboriginal people and the colonisers from the early years until as late as 1934. This year the numbers were not as big as on some occasions, but as usual, the watching crowd along ANZAC Avenue, including many in uniform, clapped as we walked by – something that continues to give me hope for change. Sadly the War Memorial itself refuses to recognise the fallen in these frontier wars, but the day will come when they have to change their tune. The massacres cannot be denied. For example, the Appin Massacre, near Campbelltown, on 17 April 1816 was a brutal killing of at least 14 Gundangara and Dharawal people. Soldiers deployed to Appin by Governor Macquarie are said to have “slaughtered and beheaded Aboriginal men and trampled women and children with horses and carts” (from NITV explainer). Reconciliation requires us to acknowledge this tragic history, apologise and make amends to current generations for this and many other massacres across the nation. And the War Memorial has a particular duty to incorporate these sad truths about the nation’s history as its contribution to Reconciliation.